Loaded with antioxidants, this functional tea contains natural joint-relievers to help alleviate arthritis pain. Enjoy notes of curry with lightly herbaceous cardamom sweetness. 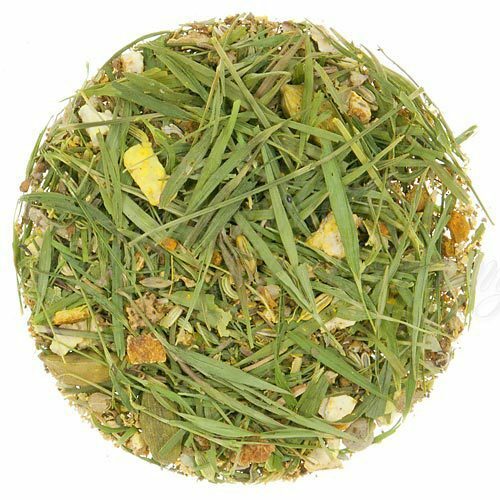 Combines turmeric root, fennel, bamboo leaves, orange peel, elder flowers, linden flowers, cardamom, dandelion leaves, and burdock root. Manufacture Type(s): Traditional process, Small batch crafted, Air and sun dried. Cup Characteristics: Opens with notes of curry and finishes with lightly herbaceous cardamom sweetness. Luxury Ingredients: Turmeric root, Fennel, Bamboo herbal, Orange peel, Elder flowers, Cardamom, Dandelion leaves, Burdock root. The knee bone’s connected to the leg bone, the leg bone’s connected to the thigh bone…and, what do you know? They’re all aching. It’s a fact: whether you suffer from arthritis or not, creaky, achy joints and bones are part of the aging process. As we age, the cartilage and ligaments that keep our body moving deteriorate from the stress of daily life, leading to stiff joints that can seriously cramp your style. Thankfully, none of this is new news. Since long before the advent of modern science, practitioners of herbal medicine around the globe experimented with natural remedies to help cure what ails us. Skeletea, our bone & joint blend, offers a rich combination of such time-honored herbs in a flavorful beverage that satisfies to the core. The blend starts with a dose of turmeric (Latin: Curcuma longa), long prized by Indian Ayurvedic practitioners and regarded as one of the most effective natural antidotes to stiff, sore joints. Fennel, another of the herbal components has also long been thought to ease the joints, (and adds a licorice-like flair to the blend.) Not to be outdone, we’ve also included Burdock Root, another noted joint reliever thanks to fatty oils that deliver an anti-inflammatory boost. Along with this trio of natural joint-relievers, we’ve added a smattering of antioxidant rich citrus, flowers and spice to deliver a cup that’s as delicious as it is nutritious. Naturally caffeine-free, if you’re feeling the weather change in your joints, you’ve got some Skeletea in the forecast. Hot tea brewing method: Bring filtered or freshly drawn cold water to a rolling boil. Place 1 teaspoon of herbal tea, 1 tea bag or 1 Q3 single serve packet for each 7-9oz/200-260ml of fluid volume in the teapot. Pour the boiling water into the teapot. Cover and let steep for 5-10 minutes according to taste (the longer the steeping time, the better the flavor as more fruit and herb flavor is extracted). Garnish and sweeten to taste. to taste. A rule of thumb when preparing fresh brewed iced herb & fruit tea is to increase the strength of hot brew since it will be poured over ice and diluted with cold water. Iced tea brewing method (Individual Serving): Place 2 slightly heaping teaspoons of herbal tea, 1 tea bag or 1 Q3 single serve packet into a teapot for each serving required. Using filtered or freshly drawn cold water, boil and pour 6-7oz/170-200ml per serving over the herbal tea. Cover and let steep for 5-10 minutes. Add hot tea to a 12oz/375ml acrylic glass filled with ice, straining the tea or removing the bags. Not all of the tea will fit, allowing for approximately an additional ½ serving. Garnish and sweeten to taste. A rule of thumb when preparing fresh brewed herb & fruit tea is to increase the strength of hot tea since it will be poured over ice and diluted.